Zayed University Takes Part in "Careers UAE 2012"
Zayed University graduates initiate "Shukran Emaraty"
Zayed University's Photography Club presents "Dubai: the pearl of the world"
The College of Information Technology at Zayed University hosted the fourth Annual Undergraduate Research Conference on Applied Computing (URC 2012) at the Dubai Campus. 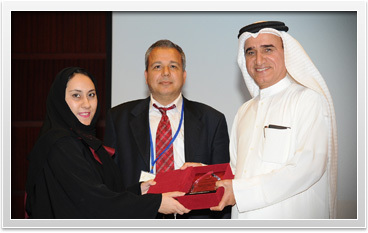 The Undergraduate Research Conference on Applied Computing (URC) aims to promote undergraduate research activity at educational institutions in the UAE, other Gulf countries, and the rest of the world, by providing a forum for students to present their work and interact with other young researchers, faculty, and industrial leaders. This year’s Conference entailed a variety of recommendations that shed light on the importance of adopting new and innovative research methods that do not merely rely on “teaching”. Under the sponsorship of Zayed University Research and Emaratech, over 30 institutions from more than 11 countries took part in the URC2012, where around 150 research papers where showcased and discussed amongst participants from the UAE, Lebanon, Palestine, Jordan, Egypt, KSA and more. The best 10 Research papers were also announced. Dr. Sulaiman Al Jassim, Vice President of Zayed University, said: “ We are very pleased that the College of Information Technology at Zayed University is regularly organizing the URC, which reflects our solid commitment to providing our students with the most advanced learning tools and environment, allowing them to enhance their leadership skills, enrich their knowledge and get in direct contact with some of the best local, regional, and international research experts”.